I was asked by a reader (thanks Anna!) to show a simple mitten tutorial. Her little guy hates mittens that are too tight and bothersome……so I wanted to show how simple it would be to make some very basic adjustable mittens. So how about trying something very simple. All you need is some scrap fleece, ribbon, and some velcro. Oh, and a sewing machine, thread and scissors of course. Start by tracing your child’s hand, with fingers closed. Then use that as a guide as you draw a basic mitten shape, making sure to leave about 1/4 inch for a seam allowance along all of the sides, and about 1/2 – 3/4 of an inch along the bottom. Cut out 2 pieces of fleece for both hands. Then on the wrong side of bottom piece of each mitten, place a piece of thin elastic at the same level as the wrist. Sew a few stitches on one end of the elastic, attaching it to one edge of the mitten…. and then pull the elastic tight as you’re sewing across the mitten at wrist level. When you finish, the elastic will pull back into shape, and will gather your fleece a bit. Now you’ll attach your ribbon adjustable strap to the top mitten piece. First, cut your ribbon about 1 1/5 inches wider than the base of the mitten, fold under the raw edge and then add about 2 inches of the soft side of the velcro to that end of the ribbon. (securing the folded under end of ribbon under the velcro.) Your finished ribbon piece will be about 1/4 inch wider than the base of the mitten. Then attach about an inch of the scratchy side of the velcro about a 1/2 inch away from the edge of the mitten, opposite the thumb side. (And at the same wrist level as the elastic on the other piece.) But you’ll sew it to the right side of the top mitten piece. Then turn the ribbon strap over and pin it to the edge of the top mitten piece, right in line with the other velcro piece…..making sure it’s at wrist level. Then place the bottom piece together with the top piece, with right sides together. Pin in place and sew all the way around the mitten (using whatever seam allowance you gave yourself when you cut out your pattern piece). The fold the the opening down a 1/4 inch/ then another 1/4 inch….then sew into place. Now, turn right side out……and you’re done. …all from extra scraps and notions in your sewing stash. « Great new sponsor and GIVEAWAY time!! These are very nice. You are so very successful. Lol. I was planning on using your fleece hat tutorial for my little one next winter (we're spending this one in the desert) and was going to just figure out how to make mittens to go with it–now I don't have to! :) Thanks! Great Idea! those are adorable! I will make it and I will LOVE it! Cute Idea!!! Why can't I ever be clever enough to come up with something so simple? Thanks for all your ideas…I love them. Oh HOW ADORABLE! I was thinking of making some mittens out of scrap fleece for me, but this would be darling for the kids. And I never would've thought of the strap. So easy. Brilliant! Thanks for sharing! How cute! 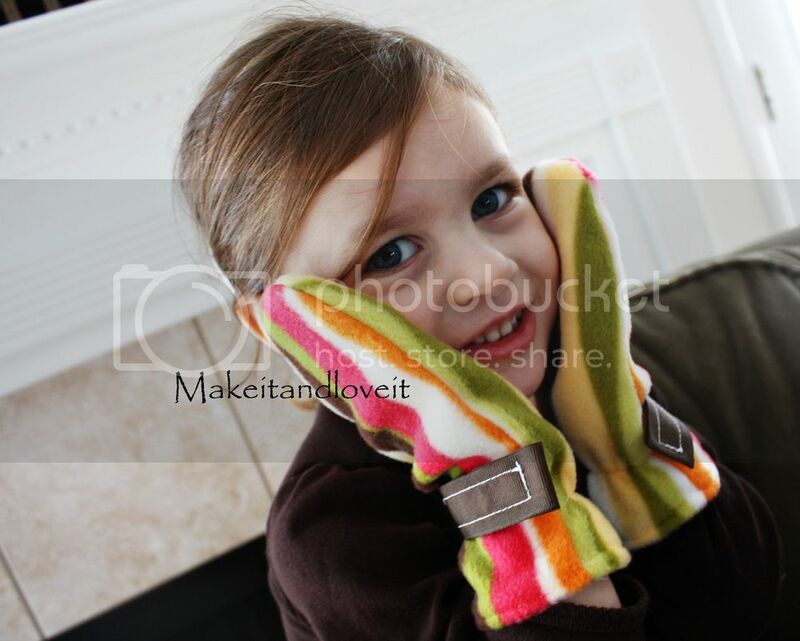 I love it…my kids are always loosing their winter gloves now I make a couple of pairs for cheap. Thanks! You make everything so easy! I am so going to make these for my 3 kids! I bought them all fleece gloves from Old Navy this year and they are SUCH A NIGHTMARE to put on! I've given up on gloves, lol. I love those mittens! 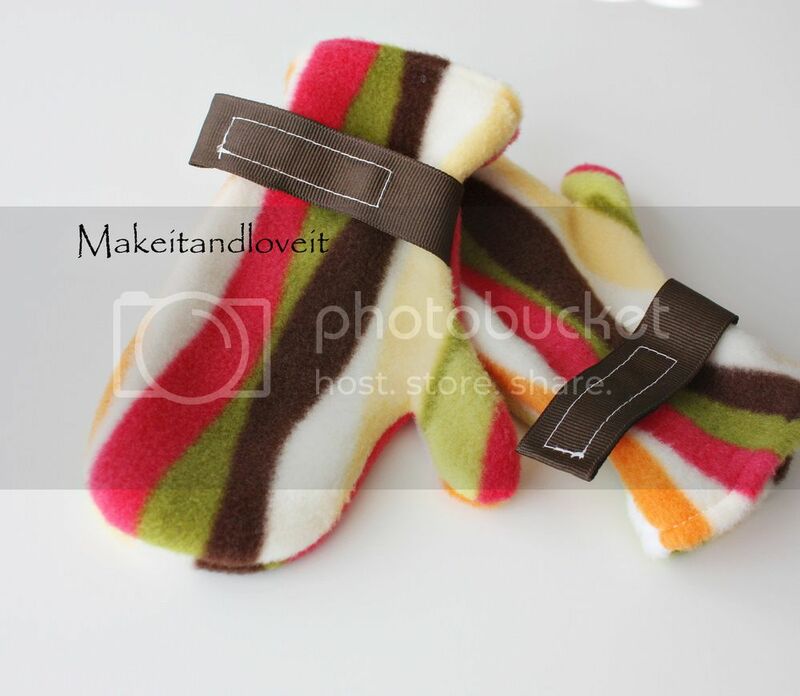 You can also use felted wool, since it won't unravel like fleece. I'm planning on making a fleece hat and scarf for my toddler tomorrow — and now I'll have to add mittens to the list! Thanks for the tutorial. Just adorable…and do-able! Thanks for sharing. cant I just say….. You are amazing! thank you for such a simple tute! These are soo adorable and it doesn't look too hard to make at all!! Thanks for sharing! I love checking out your blog. I am also and Idaho girl, displaced to the eastern side of the country. How do you have time to make all this stuff with 2 little kiddos at home? I am amazed! We love everything that you do and have linked you in many of our posts! Thanks for all your great ideas! Awesome! I have some left over fleece from making Hubby Bill a UNC blanket. I might make him some mittens! This is so cute, and wonderfully timed for us. Somehow in one week I managed to lose one black mitten and one blue mitten, so my son is wearing a mismatched pair. We should give this pattern a try. Thanks! Haha! I tried making some mittens for my daughter in a very similar method a few weeks ago and they turned out absolutely terrible. Your tutorial is great! Maybe I'll have to give it another try. :) Thanks for sharing! I have to tell you, I adore your blog… my mom said she is going to get me a sewing machine for my birthday (Feb) and your site has made me feel like I can do some really fun stuff! I have been saving these ideas in my mind, so excited for when I have time (& the machine!) to start them! I just made a pair for my niece! Hopefully they fit her! Haha. Thanks again for the tutorial! I can't tell you how much I need this pattern for my 3 kids. Thank you, Thank you, Thank you! These are so easy and cute. Is there a way to omit the velcro and ribbon and just use elastic for the wrist? I am so making these! Thanks for the tutorial! or simply run a sturdy string thru the arms of your kids jacket and sew their mittens/gloves to the ends of the strings that hang out the bottom of each sleeve.Easy Peasy! and it’s really difficult to lose them!! I was looking for pattern for sewing mittens. I have an Army blanket that I washed and plan to use that for warm wooly winter mittens for my grandchildren. Perfect!!!!! I know this post is pretty old, but I’m hoping someone will read and respond. I thought about putting some Insul-Brite in the mittens for my kids to keep their hands a little toastier and perhaps a little drier than just plain fleece ones Do you think that would work or would it make them too stiff? Anyone have any other suggestions? Great tutorial! I just made a pair of baby mittens using it. They turned out great. I just left off the thumb. Thanks! I was the design of fleece mittens, not he or she. I made them and gave them to the poor for years.